It is a bit scary to realize that Revell is celebrating its 50th anniversary. Those of us who grew up on these fantastic kits were forever smitten with the modeling bug. I couldn't wait to get my allowance or earn some money cutting grass so I could venture down to the store and pick up a new subject. As part of the 50th anniversary celebration, Revell released ten classic kits from its vast archives. This is one of those ten. This is Revell's classic Boeing 747 cutaway display model. It was released in the (then) relatively new scale standard of one-half 1/72 scale - 1/144. Even in 1/144, the 747 is a large model! During this period of model development, Revell had undertaken several cutaway subjects to provide more interest and more detail for the modeler. In addition to the 747, Revell released a few submarines, the visible Mustang, the visible Huey (anyone remember that one? ), and more. The kit is molded in white styrene and presented on on five parts trees, plus a small clear tree containing the windscreen. Unlike the other 'visible' or cutaway models,there are no clear parts used to seal off the openings into the side of the fuselage. You can see in the first photo that the main cabin is molded with the seats in place and just needs some careful painting to bring out the details. The upper deck also serves as the main cabin ceiling, and overhead baggage containers are provided for the ceiling. On the flip side, the upper deck has a lounge and cockpit. This layout is typical of American Airlines during the 1970s. The model is powered by four Pratt & Whitney JT8D turbofans though the cowling arrangement in the kit is rather unique. Since the model is standard scale, you can re-engine your Jumbo from other sources. 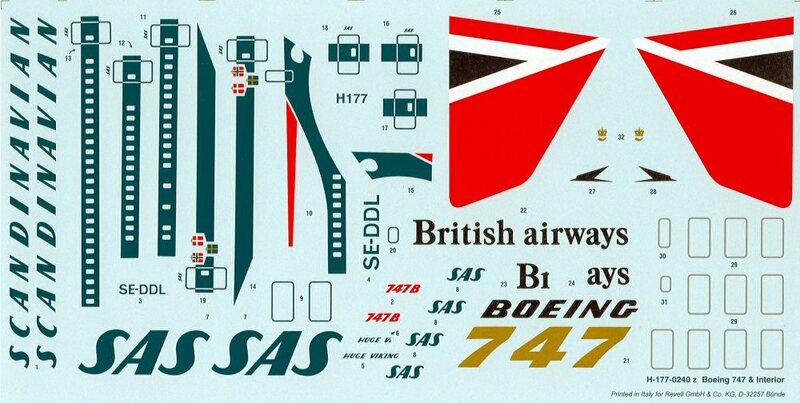 Markings are provided for Scandinavian Airlines (SAS) 747-200 SE-ODL and for an unidentified British Airways example. Those of you who are airline buffs will be able to say better than I whether British Airways ever operated their 747s with Pratt engines. I seem to recall they opted for the Rolls Royce on all of their Jumbos and you'll have to seek out aftermarket engines (or part out another kit) to render your British Airways aircraft with the proper power. As always, check your references. In any case, since this is a 1/144 scale aircraft, you shouldn't have any problem finding markings for this bird should you rather not build yours in either BA or SAS livery. A display stand is also included in the kit should you wish to display your model off of its landing gear. I had heard that Revell was releasing some of its classics and the teasers in their 2006 catalog confirmed their upcoming release. Since these were coming out of Revell/Germany, I wondered if the number of these kits available would dwindle by the time they reached North America. According to my local hobby retailer, precious few of these kits did in fact make it across the pond, so if you see one on the shelf of your local shop, you might want to snag it before you see these join the ranks of the collectables on eBay.